Justice for Jennifer! Justice for the Filipino Nation! GABRIELA received the news that US marine PFC Joseph Scott Pemberton, accused of killing Jennifer Laude in Olongapo City, was brought to Camp Aguinaldo this morning. He is currently detained in the “Mutual Defense Board Security Engagement Facility” in Camp Aguinaldo, as provided for under the Visiting Forces Agreement. We believe that the US and Philippine governments have been forced to make it appear that Pemberton is under Philippine jurisdiction because of mounting pressure from the people. Such move intends to deceive the Filipino people and is actually providing special treatment to Pemberton. If jurisdiction is indeed turned over to Philippine authorities as the US and Philippine governments would like us to believe, he should be in police custody and detained in an ordinary jail which criminals like him deserve. 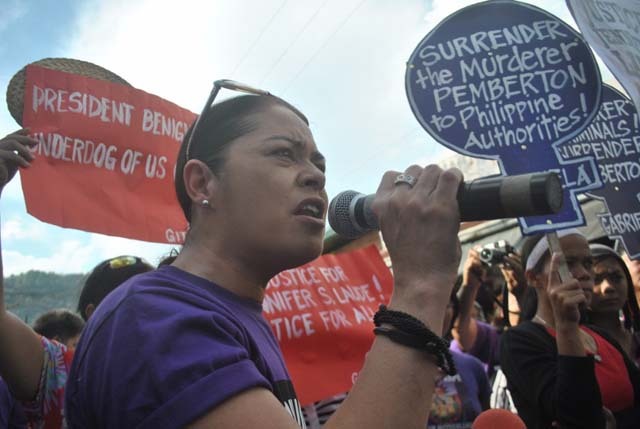 Friday 24 October, Jennifer Laude’s body will be cremated. Because of this, and the injustice involving her murder, we call for a global day of action. Light a candle, wear black, get out on the streets, … It doesn’t matter what you do, but we would like you to join us in this global day of action with only one meaning- Justice for Jennifer Laude. Saturday 18 October, GABRIELA held a legal clinic for the second time this month. During this activity survivors are invited to share and discuss legal matters with the volunteering lawyers. This can help them to process their expperiences and informs them about their legal rights. Saturday 18 October and Tuesday 21 October, members of GABRIELA went to Olongapo City to support the family of Jennifer Laude and to keep on demanding justice. Justice for Jennifer Laude but also for the Filipino people. Photo: credit to Macky M.
Tuesday 21 October, GABRIELA members joined the Peasant Mobilization in Manilla City. They marched from the University of Santo Tomas to the Mendiola Peace Arch to demand the redistribution of the land, which is now owned by landowners. Copyright © 2014 GABRIELA Philippines, All rights reserved. You are receiving this email because you are in our mailing list.